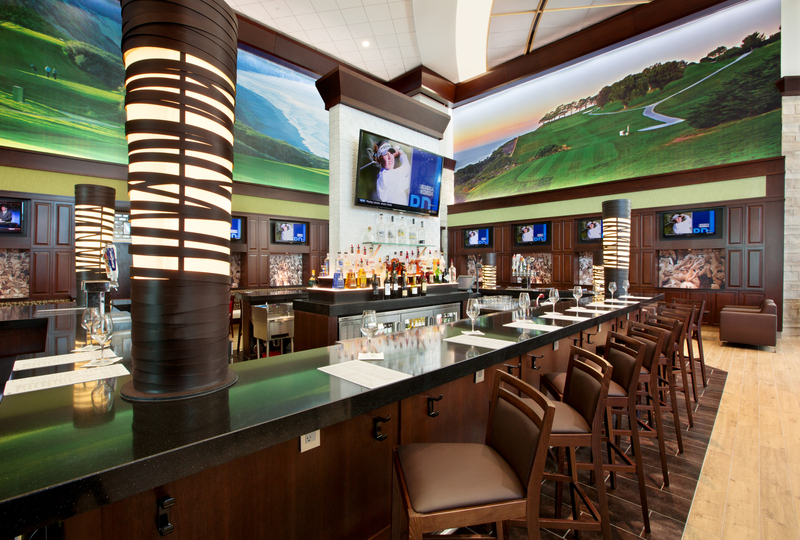 The Encinitas Ranch Golf Course’s remodeled bar and grill, now known as the Ranch Grill, is officially open and will soon be serving a brand new menu. 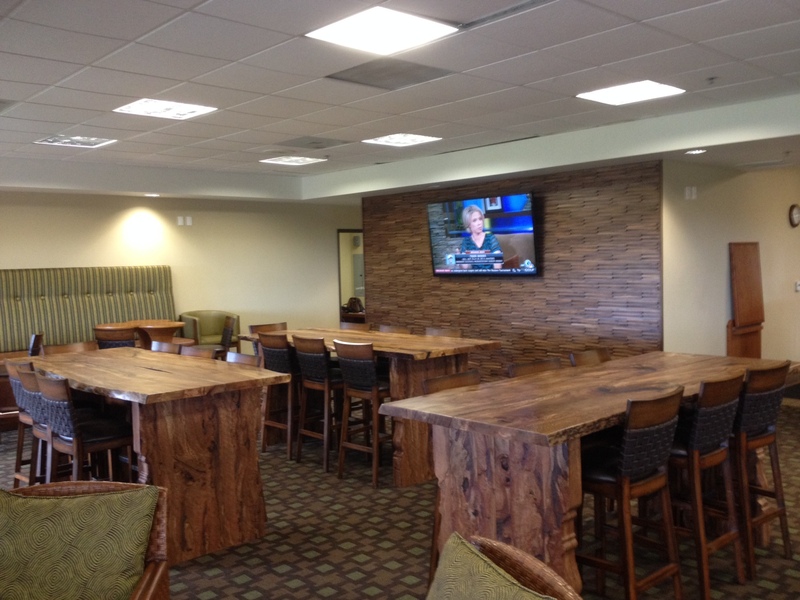 The Ranch Grill is the third phase of an extensive $1 million renovation of Encinitas Ranch. 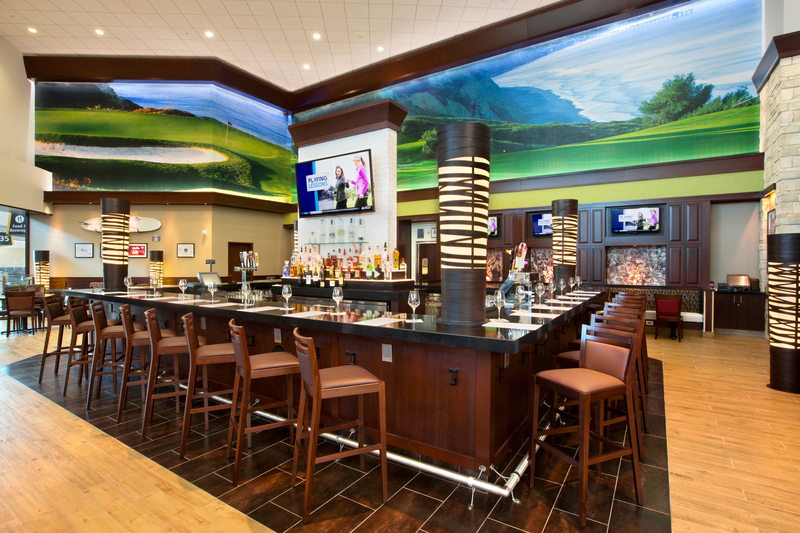 Encinitas Ranch General Manager Erik Johnson describes the Ranch Grill as a “coastal casual gastropub” that is meant to encourage post-round camaraderie and be conducive to sports-related social gatherings. “I want it to be like when I was young and for golf to become more social again, like it was meant to be. When I was a young golf professional, players would hang out at the club for another two or three hours,” he says. “We want people to come in here and settle their bets, talk about their rounds and hang out to watch the game. Encouraging that sort of activity started with a complete remodeling of the bar and grill space. Wood paneling now compliments new wood furniture that is grouped around eight television sets, including five large flat screens that will soon be connected to a brand new sound system. Guests will immediately notice three large communal tables made of aged wood that can seat up to eight people comfortably. Part of the $200,000 investment included doubling the beer taps to eight. Johnson says this was done in part to cater to the new menu, which will pair local craft brews and pub-type comfort food. Eight-ounce burgers form the base of the new menu, which will also include sandwiches, salads, an array of appetizers and breakfast. A “secret ingredient” to the new menu is Canadian culinary creation called poutine. Native to Quebec, poutine consists of French fries topped with a light brown gravy-like sauce and cheese curds. “We’ve added beer and cheddar to make it an amazing gravy to have over any of our menu items,” Johnson says. 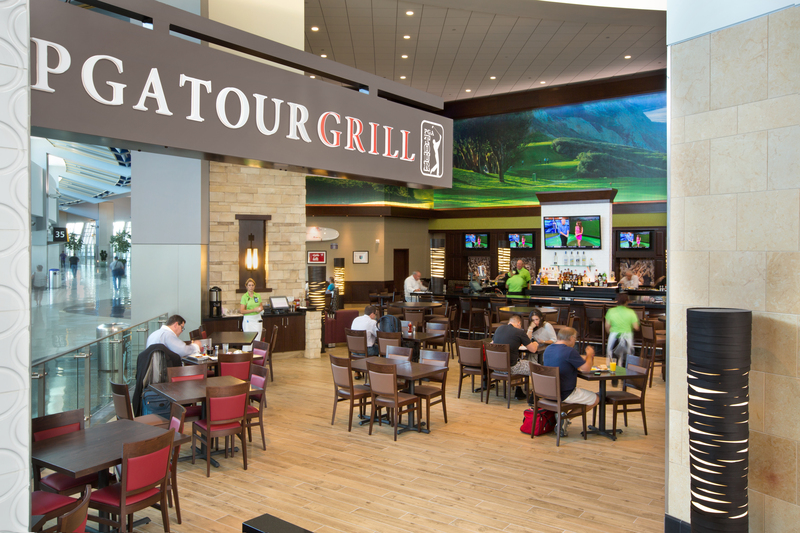 While golfers are, naturally, the immediate target for the new space, Johnson says he has ambitions of the Ranch Grill becoming a dining destination for members of the community for the sheer experience of enjoying a delicious meal in the setting of a beautiful golf course. “I think it’s going to be a cool place to hang out whether you’re a golfer or not,” Johnson says. Smoked Bacon & I.P.A Chili – Harvest vegetables, ground turkey, picked herbs and tomatoes roasted and stewed with a local I.P.A. Waffle Fry ‘Poutine’ – Crisp waffle fries topped with cheese and our house garlic & cheddar I.P.A. poutine gravy. TJ Dog – Bacon-wrapped all-beef hot dog, chipotle mayo, avocado slices, pico de gallo, shredded lettuce. Cali Burger – Pepper jack cheese, avocado slices, lettuce, tomato, red onion, mayo. The Poutine Burger – Topped with cheddar I.P.A. gravy fries. What do you get when you combine more than 200 golfers, 1,500 hot wings, 36 holes of tournament golf and throw in a few kegs of beer and a band? You’ve got Golfers Gone Wild, the wildly popular spring tournament at Twin Oaks that will celebrate its fifth anniversary on April 11th. The tournament is a JC Golf concept that originated at the Rancho Bernardo Inn but has found a home at Twin Oaks. Tournament director Scott Butler says the tournament has developed such a following that he gets asked about the date months in advance. The toughest trick for the staff is turning the golf carts after the 8 a.m. shotgun to get them out for the 2 p.m. shotgun, Butler says. What happens in between for the golfers is part of what makes the tournament unique. In the course’s beer garden, a band is playing and food and beer are being served. Hooter’s girls dole out around 1,500 hot wings. Meanwhile local breweries – this year it’s Ballast Point and Mother Earth – provide beers for tasting and Hornito’s does the same for tequila. 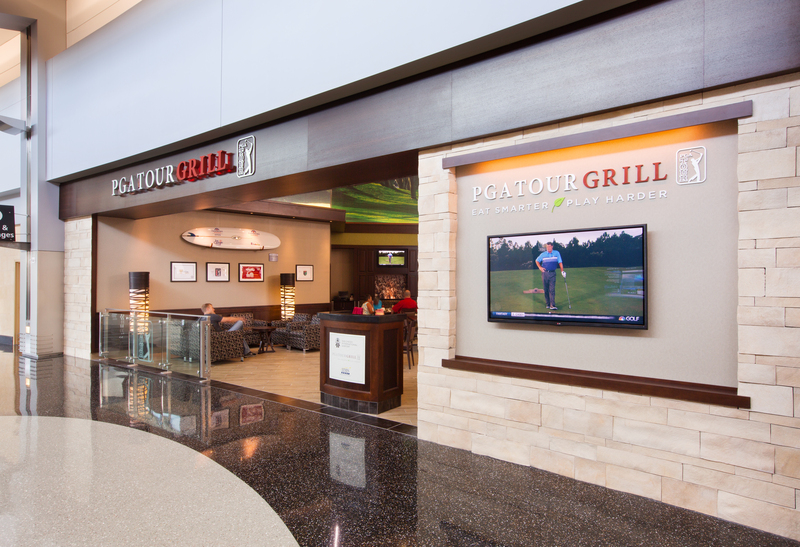 Golfers seek to sample some of all of it via a “passport” they’re encouraged to complete. Butler says the beer garden experience makes the day as much as what happens on the golf course. “It’s just a fun tournament that is different than what most people associate with a golf tournament,” he says. “This is more about the atmosphere of the event than the actual golf. As for the golf, Butler says the unique set up of the course includes two holes on the par-3 17th. Called “Seeing Double,” the hole provides a closest-to-the-pin contest to either pin. Of the more than 200 golfers that participate in the day, a few choose to play 36, Butler says. For the price – $55 a player, $220 a foursome – Butler says the tournament is an incredible value for players. A few spots remain for Golfers Gone Wild. You can sign up at http://www.jcgolf.com or by calling 760.591.4700.